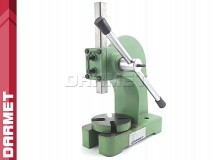 Arbor press is a small, manually operated press, typically used for smaller works such as staking, riveting, installing and removing bearings, etc. Depending on the task we want to perform, insterts, punches and other tools may be added to the end of the ram. Arbor presses are distinguished by the maximum load they can apply. Most commonly available presses are those with leverage bewteen 1 and 5 tons. This leverage is achieved when a force is applied to the lever arm or wheel.